The Kickstarter has been pretty well finished up and right now I’m gearing up to resume production for those who didn’t get their fill of resin during the campaign. 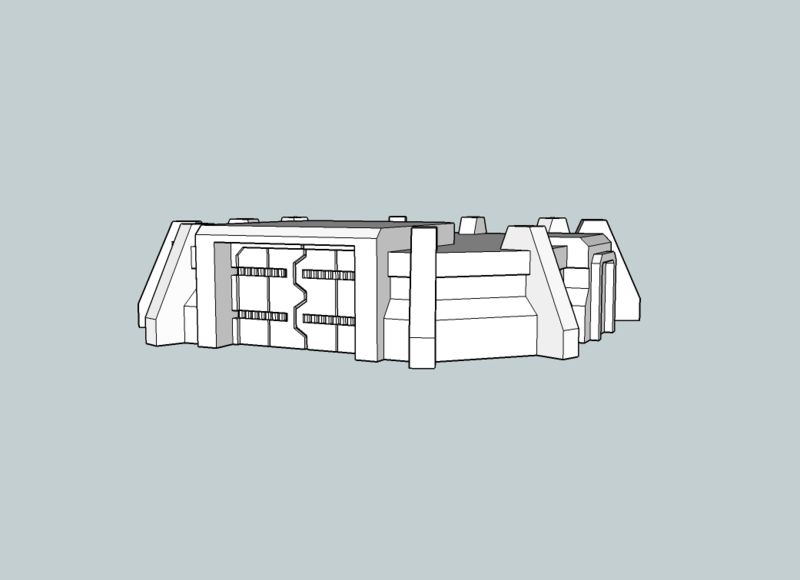 Nearly all the molds are being redesigned to be smaller and more efficient, and I’m tweaking the designs of some of the pieces so they should have a lower miscast rate. 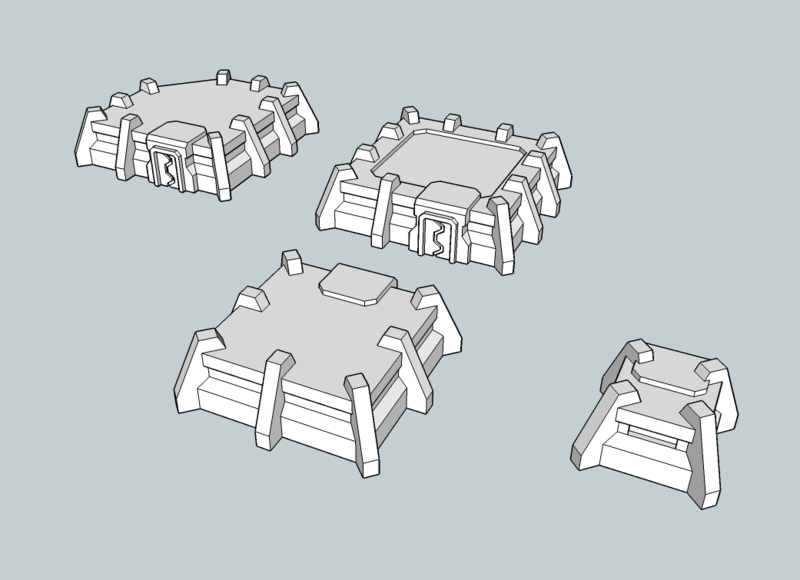 A couple patterns need new 3D-printed master parts so they’ll take a little longer, but my goal is to have buildings available for sale by the end of this month. 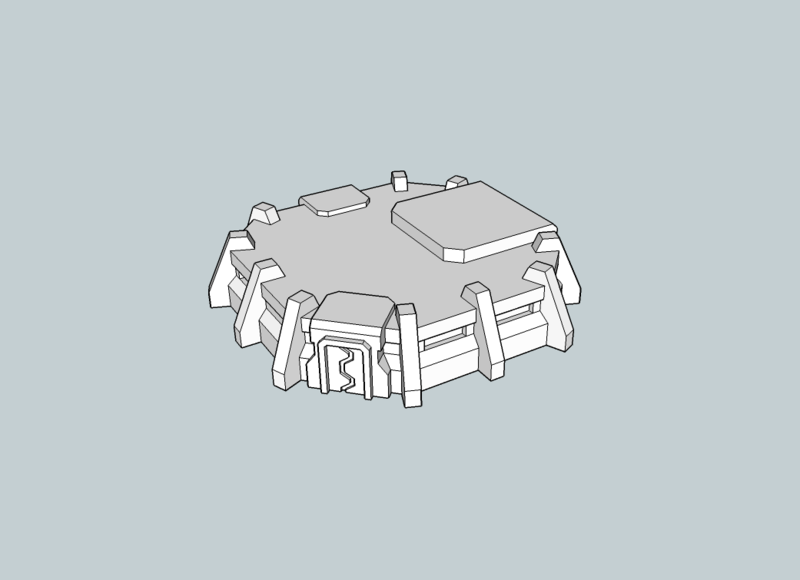 Plus, I’m working on a couple new designs and pieces – you can find some preview renders down by the bottom of this post. Time to take a look at the project and see how everything went. I could just blather on about it, but instead fancy infographics! 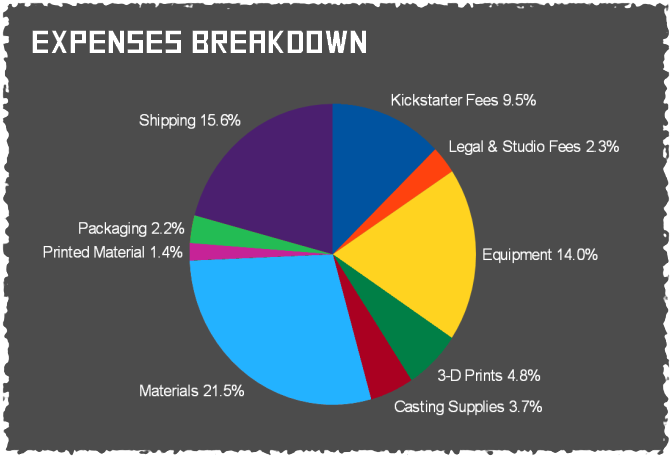 The lion’s share went to equipment, casting materials and shipping – no surprises there. Fees ate up a bit more than I expected. This includes Kickstarter’s pound of flesh (5% right off the top), Kickstarter’s OTHER pound of flesh (payment processing fees) and a business license to avoid hassling by The Man. Filling my car with jugs of chemicals already feels a little sketchy and I have to assume they’ve watched Breaking Bad. So what did I make with all that? Which little buildings won the war for love and affection? A pretty even split, at least for the Small and Tall buildings. Medium is more a mixed field, but that makes sense considering it had the greatest variety available. 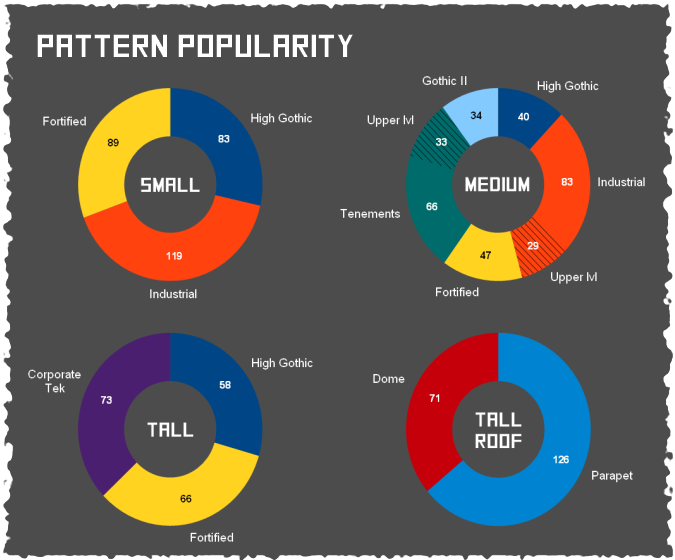 Industrial was the single most popular pattern, followed by Fortified (benefiting from being available in all three sizes). 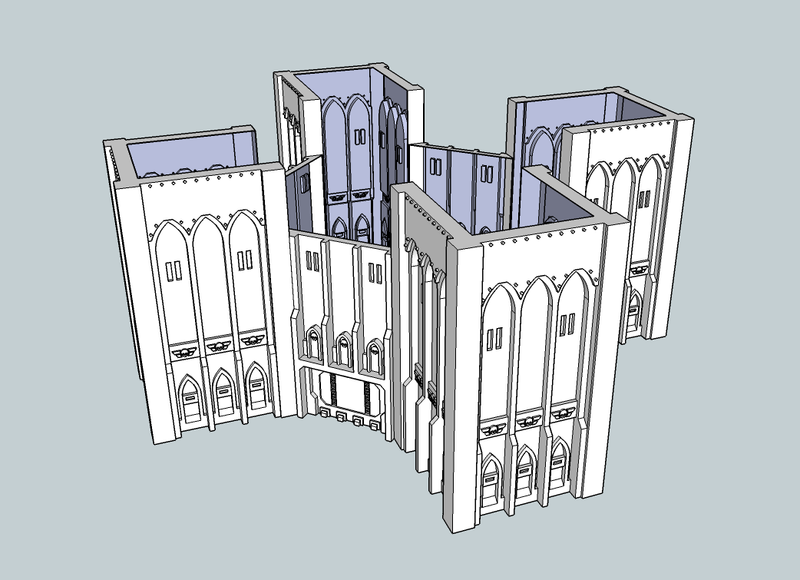 I guess it’s a good thing I added the Parapet Roof, too. Actually, for what I was afraid it might be this isn’t that bad. 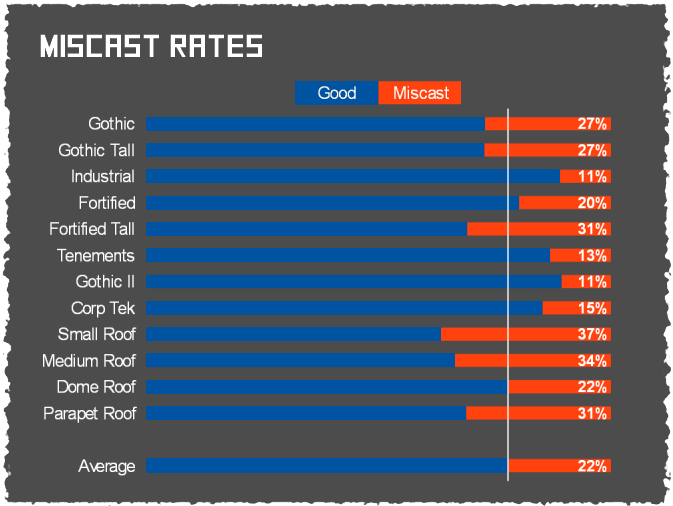 The miscast rate exceeded my initial estimates, but those were really just a guess at something I’d never done before. This counts every piece that wasn’t good enough to send out to backers – there are tons of parts counted as “defective” which I can salvage quite easily for my own use. The problems are where I expected them to be (looking at you, Small Roof) and I was already planning on reworking how those parts are cast. 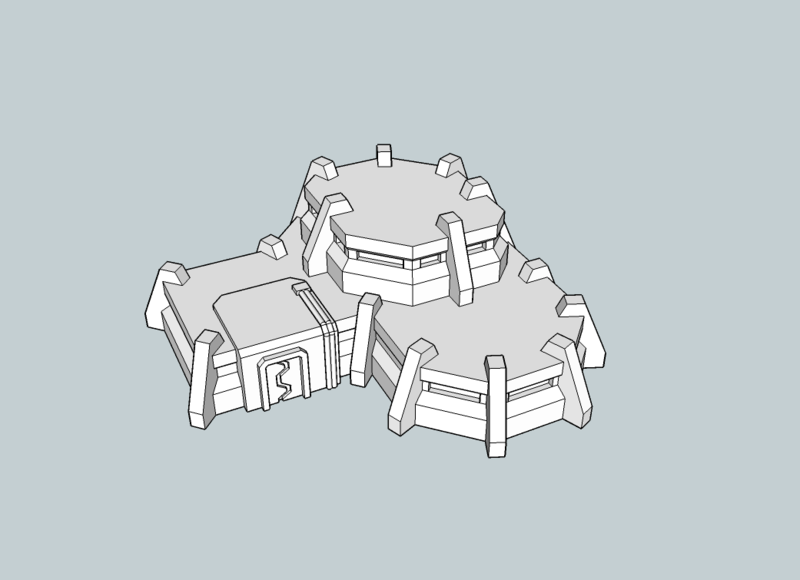 But I think this helps explain why the project took longer than it should, on top of the fact that I expected to make about 250 buildings and ended up with nearly 900 of the things. I made one key mistake when planning – I accounted for the cost of miscast pieces, but not the time it would take to replace them. I had a plan to improve the success rate by thickening the wall pieces, but based on this data and some test molds I’ve made the math doesn’t actually work out. Making each piece just 1mm thicker increases its volume (and cost, and weight) by up to 80%. Even with the most fail-prone patterns, that’s just not worth it. It makes more sense (even counting the extra time this…time) to make thin, light pieces that turn out less often. Maybe I can grind the miscasts up and fill a beanbag chair or something. The process and product are sound. Feedback has been positive. Production is set to continue and new designs can be added without much trouble. 0% of budget spent on potato salad or moving to Portland. LATE. I really wanted to deliver on time (as so many Kickstarters fail to do) but it didn’t work out. Didn’t plan enough for success – I ran out of prepared stretch goals and graphics in the first day and had to wing it from there. Some pieces cast poorly and wasted time and materials. They’ll need to be improved before production resumes. Not having things done on time meant a massively unpleasant time crunch when my other commitments hit in early September. Coffee consumption continues to spiral out of control. This project has been an amazing experience – people who I’ve never met all over the world believed in this project and in what I created. That’s a fantastic feeling and I’d like to say thank you to everyone who backed the project, helped me along, or even just came here to read about my little corner of insanity. Thank you! Lastly, here’s some work-in-progress renders of new stuff I’ve been tinkering with, which hopefully you’ll be able to add to your games in the near future. Have a great new year and as always, thanks for reading!